UVI President David Hall has concentrated on improving the university’s retention and graduation rates while making it his personal business to introduce and help shepherd Black males through the college experience. Year round, the Virgin Islands are a popular destination spot for thousands of vacationing tourists from across the world. But amid its sandy beaches and gorgeous palm trees, educational leaders here say that the University of the Virgin Islands (UVI) — which is the only university outside the continental United States designated as a Historically Black College and University (HBCU) — has for too long operated under the radar screen. Even the university’s current president, Dr. David Hall, concedes that not too long ago, he was woefully ignorant about UVI’s storied history until he decided to apply for the presidential post. And by most accounts, he’s done precisely that. Although the overall enrollment at UVI has consistently gone down (a challenge that besets most HBCUs), in his four years as the head of the Virgin Islands’ lone college, Hall has improved retention and graduation rates while making it his personal business to introduce and help shepherd Black males through the college experience. For Hall, who may be beginning to think about his legacy, his advocacy for Black males will certainly rank high on his list. And the opportunity to carry out that legacy has been initiated with the recent completion of negotiations with the school’s board of trustees for an 11 percent salary increase and a five-year contract. When a group of Black male students at UVI formed an organization several years ago called “Brothers with a Cause” to help recruit, retain and graduate other Black males from UVI, Hall quickly embraced their efforts. The college has also created various initiatives for junior and high school boys across the island, including hosting an annual “Man Up” conference that brings nearly 3,000 boys to the university’s two campuses on St. Thomas and St. Croix. Last October, UVI was the host site for the second annual International Colloquium on Black Males in Education convened by Dr. Jerlando F. L. Jackson, the Vilas Distinguished Professor in Higher Education at the University of Wisconsin-Madison. 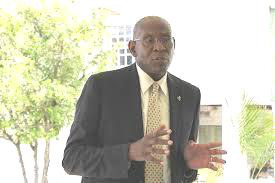 After several decades in academe, during which he’s held powerful administrative positions at various colleges and universities, Hall appears most comfortable helping to improve UVI’s standing on the international stage. During his short tenure, the soft-spoken leader, who earns $350,000 per year and was recently awarded a $35,000 per year increase in pay, has at times clashed with faculty members who have accused the administration of paying its faculty low wages. Gaskin says that faculty has been operating without a contract for the past seven years and is burdened by heavy teaching loads. But Alex Moorhead, who chairs UVI’s board of trustees, says that he’s been impressed by Hall’s vision. V.I. Senator Clarence Payne says that he’s impressed by Hall’s accomplishments. Student leaders have largely expressed their support for Hall, saying that he is a visible presence on both the St. Thomas and St. Croix campuses. Many applaud his efforts in authorizing the creation of a new radio station — WUVI — which was launched last year. With limited resources and a small faculty and staff, Hall has also been able to do what most thought was nearly impossible — convince donors to invest in the college. He’s captured the attention of investors like entrepreneur Kiril Sokoloff, who recently donated $5 million to the university to support student entrepreneurship efforts on campus. UVI now has a minor in entrepreneurship, and thanks to Sokoloff’s gift, Hall was able to recruit Dr. Timothy L. Faley from the University of Michigan to serve as the school’s first endowed chair in entrepreneurship. annual competition where teams of students work with faculty to develop a viable business initiative. The top three teams are awarded $60,000 as seed money to pursue their enterprising idea. As other HBCUs are struggling, UVI is building. In 2012, the university opened a 100-bed residence hall and hopes to break ground on a new multipurpose facility on the St. Croix campus. A new major in hospitality and tourism management has been established and will offer its first doctoral program in the next two to three years. UVI’s endowment is $34 million. Alumni giving, the highest of any HBCU, is now at 51 percent. As most college presidents are dashing off to meetings on their respective campuses, Hall is boarding a C-plane from St. Thomas every Wednesday to make the short flight to UVI’s St. Croix campus. There he holds office hours and visits with students and staff.